Since then, the winner of the Olympic decathlon event – consisting of ten track and field events, held over two days – earns this coveted tag, along with his gold medal. The event traces its history back to the pentathlon competitions which were held at the Ancient Greek Olympics. That involved five disciplines – long jump, discus throw, javelin throw, sprint, and a wrestling match – introduced in Olympia in 708 BC. Some 2600 years later, the event evolved into the modern decathlon, consisting of ten events – 100-metre sprint, long jump, shot put, high jump, 400-metre sprint, 110-metre hurdles, discus throw, pole vault, javelin throw and 1500-metre race. The decathlon, not surprisingly, is by far the most physically taxing event at the Olympics. More importantly, it is the only test of all-round athleticism known to humankind. Performance is judged on a points system in each event, not by the position achieved. Your score is dependant on your time in track events, and distance or height in the field. 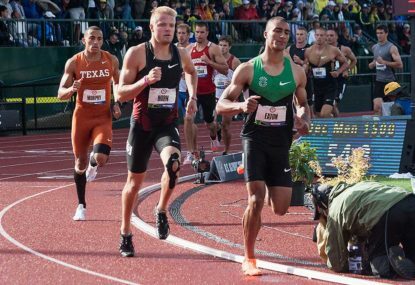 The current world record rests with an American, Ashton Eaton, who scored 9045 points at the 2015 IAAF World Championships. To put this in perspective, if someone at a decathlon was to match the world record in each respective event, the total score would be 12,560. And if someone were to match the total decathlon score for the best performances ever during decathlons in each discipline, that score would be 10,544. So Eaton’s 9045 points is the mark of a truly great all-round athlete. Starting with Jim Thorpe and the first time the decathlon was held as an official Olympic event in 1912, Americans have won a staggering 12 of the 23 gold medals awarded. With Eaton to participate, it is most likely that 13 of 24 will be the result when the event concludes on August 18 at the Olympic Stadium in Rio. For those of us who grew up in the 1980s, Daley Thomson was a household name. This remarkable British athlete was crowned the best athlete in the world not once, but twice. If any questions remained after his decathlon gold at the 1980 Olympics in Moscow – because of the boycott of the western nations – he silenced all detractors by repeating his performance at Los Angeles in 1984. And, just to prove a point, he slipped in a gold at the World Championships in 1983, where all his competitors from both sides of the Iron Curtain participated. With a high of 8847 at the 1984 Games, Thompson remains at the No.5 position in the all-time decathlon standings, 32 years later. There have been a few good men who have won this coveted title in the 100 years since Thorpe first won the respect of the King of Sweden. American Bob Mathias achieved at the 1948 and 1952 Olympics the feat Thompson was to repeat 30 years later. Dan O’Brien won only one Olympic Gold, in 1996, but also took home three successive World Championship gold medals – in 1991, 1993, and 1995. Roman Sebrle of the Czech Republic achieved the second-highest points ever achieved in the Decathlon, 9026, won an Olympic gold in 2004, and a silver in 2000, besides a World Championships gold in 2007, over the course of a remarkable career. At Rio, the focus will be on Belgian decathlete Thomas van der Plaetsen. At the World Indoor Championships in 2014, he won a bronze before being pulled up for doping, with an abnormal test for the HCG hormone. After being vilified by the Belgian and world press, medical tests found the source of the abnormality – testicular cancer. A tumour removal and several rounds of chemotherapy later, Plaetsen has made a remarkable comeback. He travels to Rio as the European decathlon champion of 2016, and a real shot at the gold. Ashton Eaton will do well not to take his crown as the world’s greatest athlete for granted when he steps on to the Olympic Stadium later this month.